A friend gave me a set of Essie mini's for Xmas, from the 2009 spring collection. This one is called Status Symbol and I'm wearing 3 coats with a coat of SV. Hot pink is my kind of color! 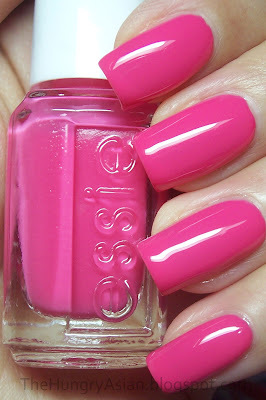 I love Essie mini's, the brush is big and the polish is so easy to apply (cough cough OPI!). Oh yay, I love a happy bright pink! It looks fab on you! I've been eyeing this color for awhile, now I want it more! Such a pretty pink color! Oh, NICE. Going on my list, Kae! This is so cute. And I hate the OPI minis too! WTH is wrong with those things. Color Club has nice minis too. Take a hint, OPI! Haha! Seriously, this color totally suits you. Woohoo, ring in spring! What a fabulous pink! Another addition for my mile long wish list. Thanks for sharing!!! Very pretty pink. I'm beginning to like mini's since I'll never finish a regular sized bottle. I still have a hard time buying them. I bought just a few.